This bucket is perfect if you perform the Miser's Dream in large venues as the sound it makes when a coin is dropped in is very loud and distinctive. The magician shows an empty bucket. 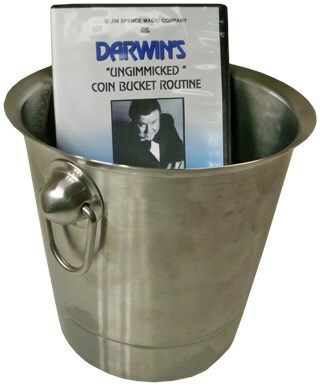 He plucks coins out of thin air and tosses them into the bucket...it creates the LOUDEST RING you've ever heard! No gimmicks! Built to last forever. Comes complete with an instructional DVD. Highly recommended for professional stage entertainers. We're proud to offer a product that we believe is the best that money can buy.